Pic Caption: ABG President Grand Chief Dr. John Momis receives the share certificate from BIEG Ltd Chairman Jason Fong while the ABG Minister for Economic Development, Fidelis Semoso looks on. The autonomous arrangement on Bougainville cannot function effectively without an economic revenue stream to sustain it. The ABG Minister for Economic Development, Fidelis Semoso made the statement during the Autonomous Bougainville Government’s purchase of five hundred thousand shares (K1 per share) in the Bougainville Import and Export General Corporation Limited (BIEG) worth K500, 000.00 last Friday. “Despite the current economic turmoil in the country the Autonomous Bougainville Government continues to strive to create tangible economic development on Bougainville,” Mr Semoso said. “The purchase of the shares signifies the ABG’s commitment to give meaning to economic recovery on Bougainville,” Semoso said. Semoso said that the purchase of the shares did not mean that the government was ignoring local businesses. “The ABG is committed helping indigenous businesses as shown through our initiative to let locals borrow from the National Development Bank start up or support capital for their businesses,” Semoso said. Semoso said the K2 million given to NDB to allow locals to loan to support their businesses would be increased next year to allow more stimuli in Bougainville’s economy. The BIEG is a joint venture between the ABG and a Chinese corporation that is involved in numerous projects in the agriculture and manufacturing sector on Bougainville to create a self-sustaining economic drive in the region. 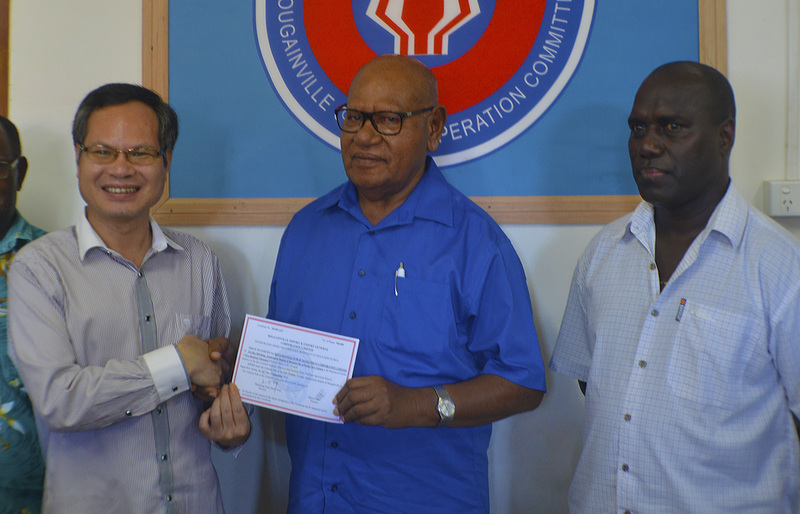 ABG President Chief Dr John Momis also congratulated Minister Semoso and the Department of Economic Development for the initiative in creating more economic opportunities for Bougainvilleans. “I want to encourage the people of Bougainville so that we can all be involved in this task of creating a common thrust to empower the people of Bougainville and liberate ourselves from the syndrome of dependency,” the President said. The President also made mention of the current financial dilemma in Bougainville but he said the people showed exuberance in creating their own business ventures with minimal help from the government and that showed a dynamic movement of people. Over one million shares in BIEG Limited have already been purchased by Bougainvilleans prior to the ABG’s purchase and this number has been steadily growing. On behalf of the people of Bougainville the ABG shares will be held by the government’s business arm the Bougainville Public Investment Corporation Limited. The Autonomous Bougainville Government President, Chief Dr John Momis has made a call for unity to all Bougainvilleans as the region prepares to decide its political future through a referendum. “Bougainvilleans must unite to implement the Bougainville Peace Agreement and the Referendum peacefully and let it be a process of integrity,” Momis said. “Bougainvilleans are a highly favoured people, due to the Bougainville Crises it is only in Bougainville that we have the unique opportunity to develop a new socio-economic political order and determine our own political future,” he said. Momis said that Bougainvilleans must understand that they must be prepared to except the consequences of their decisions come the referendum in a couple of years’ time so it was imperative that the people make informed decisions to determine their future. “If we mess it up now then we are bound to fail and not realize our aspirations but if we follow through with the Bougainville Peace Agreement and respect the rule of law, promote good governance and except the responsibility of our actions then we will be able to liberate ourselves,” Momis said. Momis also urged Bougainvilleans to do a self-analysis and embrace their core values that comprised of Christian and cultural principles that would refine Bougainville society and give a strong foundation to the people as they move toward the future. “Our world view is one that not only ends here but extends to the future and onto the next life and is one that looks toward creating a just society that empowers the people and respects their dignity,” Momis said. The Referendum to determine Bougainville’s political future has been slated for June 15 2019, though only a working date it is highly practical proposal consensually agreed upon by the ABG and the National Government in the Joint Supervisory Board early this year. Meanwhile both the ABG and the National Government are at loggerheads over the GoPNG’s continued delay in releasing grants owed to the ABG. The continued financial chokehold the GoPNG has over Bougainville and recent fiasco surrounding the Bougainville Copper Limited shares has sown the seeds of discontent erupted strong nationalist feelings amongst Bougainvilleans. Even the multi-million kina road sealing projects on Bougainville have come to a halt with the GoPNG showing no imitativeS to move ahead with the projects which have been tendered and contractors already on site. Totally underbelievably that you President Momis support such behaviour.